Marginalia government to cancel the work of Herzog & de Meuron on the train station Archi-new - Free Dwg file Blocks Cad autocad architecture. Archi-new 3D Dwg - Free Dwg file Blocks Cad autocad architecture. According to government statements, it is unlikely Swiss Office Herzog & de Meuron and the Australian company Hassell be carried out their work at the train station the Australian iconic Flinders Street Station and around the building in Melbourne, including the restoration of historic dome and clock tower of the special. The offices Alshahyran may profit for the renewal of the train station building and began operational work that has been more than a million Australian dollars by the exchange competition; but the new Labour government in charge of the south-eastern region of Australia told ABC News the news channel that the project will cost more money, including nearly A $ 2 million, which is "a lot of money for a little profit." "Previous government has put millions of dollars in Design Competition For our part we criticized this a lot, especially when we were in opposition, where we said that the design competition does not fit with the priorities of the community." According to Tim Pallas told Secretary of the Treasury in the government, who added that a final decision has not been taken yet, and it is believed that it can not be more than 20% of the commercial finance income; "it will be played extraordinary burden on taxpayers." As he put it. For his part, the architects Herzog and Moudn whether they have won the competition superior to their competitors Zaha Hadid and Grimshaw in 2013 my design proposal included the establishment of a construction contract with a ceiling above the station location. 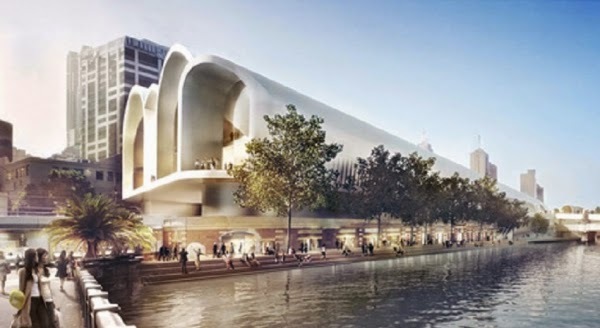 It also planned to add new art hall dedicated contemporary art with a public square and open market and a theater and a permanent headquarters for some cultural organizations celebrations in Melbourne. It was hung on the government's decision as "a political decision to take an ongoing process."